Portions of this review appear in our coverage of the one-disc 'Captain America: The Winter Soldier' Blu-ray. Marvel is having a hell of a year. First, the thrilling 'Captain America: The Winter Soldier' and then the supremely fun 'Guardians of the Galaxy'. Heck, I don't know how exactly they're doing it, but I'll tell you this, they're taking some smart risks. Switching up genres. Testing out different ways to tell superhero stories. Trying to redefine what it means to be a superhero and to live in a modern world where fanatical things -- both good and bad -- have started happening more and more. My personal theory is, by unifying their Cinematic Universe, Marvel Studios has essentially created the world's most expensive television series, which continues to invest us in the characters as they change and grow and evolve. I'd also argue Marvel's Cinematic Universe Phase Two is a more daring series of films than Phase One. But maybe I just love films that are more in line with darker, troublesome "second acts". 'Winter Soldier' is similar to 'Iron Man Three' in that it takes our confident hero, and tears away everything comforting, changing everything he knows about the world. Steve Rogers (Chris Evans) remains a man out of time. An outsider in a world that's moved on, where his only close friends are an assassin, a secretive boss, and a bed ridden woman with dementia (who used to be the love of his life). Cap is a man looking for something to believe in because, while he's still a guy who follows orders and does what's best for the mission, he's also starting to question Nick Fury's (and by extension S.H.I.E.L.D, the intelligence agency for which they both work) need for keeping secrets all the time. When Fury (Samuel L. Jackson) does reveal one of his secrets -- S.H.I.E.L.D. has built three more Helicarriers to act as a remote, intelligent worldwide defense network against threats domestic, international, or alien -- Cap doesn't agree with this plan. "This isn't freedom. It's fear." Around this time Fury begins to suspect something's wrong inside S.H.I.E.L.D. His passwords are failing. Files unable to decrypt. Someone is working against him, and he needs to bring in help, but before he can, Fury's ambushed on the streets of Washington DC in a fantastically tense car chase. He barely escapes to Cap's apartment where moments before being shot by the mysterious Winter Soldier, Fury hands Cap a thumb drive (our clue to learning the truth) and telling him to trust no one. When Cap refuses to tell Alexander Pierce (Robert Redford) -- an ex Secretary of Defense who made Nick Fury director of S.H.I.E.L.D. -- why Nick Fury went to Cap's apartment, everything changes. S.H.I.E.L.D. declares Cap a fugitive and starts hunting him. Cap must go on the run with Black Widow (Scarlet Johansen) to find the truth behind who has infiltrated S.H.I.E.L.D., the identity of the Winter Soldier, and what may happen if Cap can't shut these people down. I love that 'Winter Solider' has been crafted in the style of a '70s conspiracy thriller (in the Audio Commentary, the filmmakers joke they could have called it 'Three Days of Captain America' in a nod to Robert Redford's classic 'Three Days of the Condor'). It works so well from a character standpoint. Over the last few years, I've had a few conversations about conspiracies in the Internet age. My theory was that you can't really do these 70s-style thrillers anymore because way too many people assume everything's always a conspiracy. IE, when the audience's expectation is that there is a conspiracy, it's not really a great surprise when there is one. However, the filmmakers behind 'Winter Soldier' figured out a new take on the genre. Because Cap is such an earnest human being... Because he's trusting... Because he's working for the Good Guys using all the technology we've seen in the previous movies... Because of all of this, it's terrifying when Cap has to go on the run. When his only option is to fight the very agency for which he's been a soldier. A world where S.H.I.E.L.D. is the enemy, in this Marvel universe, is the emotional equivalent of your parents getting a divorce. It's unnerving, and dramatic. 'Winter Soldier' is also a great character piece. I loved how the first thirty minutes were a slow burn of small moments. Cap with a new friend, Sam Wilson (Anthony Mackie). Cap with Peggy Carter. Cap with Natasha. Even Cap with Nick Fury. All of these people, save for Peggy, have journeys in the film, where the world they think they know is burned away, and they're forced to rise up and change. The action sequences, inspired by masters of tension like DePalma and Friedkin, are extremely well articulated. Sometimes gritty. Never repetitious. Terrific geography and a sense of ramping tension. At the end of the day, much like 'Iron Man Three', this second standalone 'Captain America' film is tons of fun, successfully uses a classic character in a new modern setting, reimagines what possible in superhero films (or, rather, extends beyond the traditional approach), and tears away any sense of safety and security the Marvel Cinematic Universe has established over the life of the franchise. Everything has changed. It's time for the Avengers to assemble again. And I can't wait. 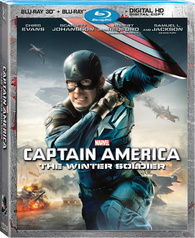 'Captain America: The Winter Soldier - 3D' debuts on Blu-ray as part of a two-disc Blu-ray 3D + Blu-ray + Digital HD Combo Pack. I specifically purchased the Best Buy exclusive steelbook that, priced equal to the standard 3D editions, features an iconic image of Cap standing in the belly of an aircraft above a helicarrier and Washington DC. On the back, there are four character posters for Falcon, Nick Fury, Black Widow, and Alexander Pierce. Inside, there are instructions to unlock your Digital HD copy as well as some Marvel Extras. There is no DVD. On the Blu-ray 3D, the only trailer (or sneak peek) is 'Guardians of the Galaxy', which look fantastic in stereo. On the standard Blu-ray, trailers include 'Guardians of the Galaxy', 'Agents of S.H.I.E.L.D Season 1', and an older ad for Marvel's Cinematic Universe Phase One. 'Captain America: The Winter Soldier' punches its way to Blu-ray 3D with a high quality AVC MPEG 4 encode framed in the film's original 2.40:1 theatrical aspect ratio. Much like its 2D sibling, this 3D transfer is everything you'd expect from a modern blockbuster. Bright colors. Unlimited resolution. Endless textural details. Solid black levels that never crush. As a 3D title, 'Winter Soldier' is very good -- just shy of perfect, just shy of (for me at least) adding to the overall movie experience. Nitpicks aside, it more often than not achieves that perfect sense of a window into another world, thanks to an appreciable sense of depth, strong shadow details, and brightness levels generally matches its 2D counterpart. Only a few shots are a little flat or soft (particularly flying through clouds in the opening action sequence) and some of the action sequences are a little too choppy to make for excellent 3D. Other than a very minor quibble here or there, great job. No pixelation, banding, or other encoding errors. 'Captain America: The Winter Soldier' makes one heck of a Blu-ray; I just don't care if this particular title is in 3D or not (though it's certainly not bad 3D). 'Captain America: The Winter Soldier' battles its way to Blu-ray with a reference quality AVC MPEG 4 encode framed in the film's original 2.40:1 theatrical aspect ratio. 'Winter Solider' makes for flawless high definition movie watching. Just like its 3D sibling, this movie features crisp black levels, even skin tones, vivid colors and, save for a few soft focus issues, a fantastic sense of resolution. Every real world set, hair follicle, bead of sweat, and stitch of fabric is full visible. The filmmakers, with cinematographer Trent Opaloch, have shot a gorgeous movie augmented by the very best special effect available today (water still looks fake, though). I think this title will be particularly great for those with constant height widescreen projection set ups. Another topnotch HD video presentation from Marvel. 'Captain America: The Winter Solider' zooms, booms, and blasts its way onto Blu-ray with a reference quality 7.1 DTS-HD Master Audio soundtrack. Studio blockbuster sound mixes are too good these days. The filmmakers are really smart to juxtapose moments of tender subtly with punctuated blasts of sound. This is a disc that excels at ramping up and down its dynamic range. Dialog levels are clear, even during heated action. The panning effects are precise and immersive. And the heart-in-your-throat aerial climax is a nonstop LFE demo session. The climax is an aural assault you'll enjoy again and again. Equally parts aggressive and moments of quiet atmosphere, it's all but impossible to find any flaws in this 7.1 DTS-HD MA sound mix. 'Captain America: The Winter Soldier' is pretty light on Bonus Material (let's assume the Marvel Cinematic Universe Phase Two collector's edition will cover more). Here is what you will also find on the DVD. Steve Rogers' Notebook (HD, 2:26). Each region where the film release got its own insert-shot of Cap's notebook where he writes down cultural events he missed while frozen. Deleted and Extended Scenes (HD, 3:36). Available with optional directors' commentary, here's what didn't make it into the final film. 'Captain America: The Winter Soldier' is a terrific homage to '70s conspiracy thrillers and another solid entry in the every-improving Marvel Cinematic Universe. 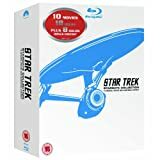 The 3D Blu-ray (or 3D Blu-ray Steelbook) offers a strong 3D presentation, perfect 2D video, and a reference quality 7.1 sound mix, though the Special Features are a bit lacking despite a great Audio Commentary. The only thing to really consider is, for a $5 premium, do you enjoy 3D? While this 3D presentation is strong, I'm not sure it makes the movie experience any more immersive (which is my personal benchmark). For this reason, I'd call this 3D edition Recommended (while the 2D release gets a Highly Recommend).